This is the first game in the Rolling Thunder series. 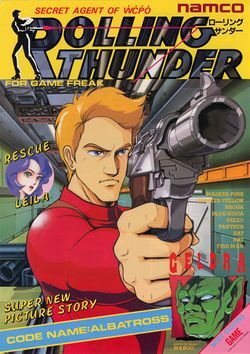 For other games in the series see the Rolling Thunder category. Rolling Thunder is a run and gun arcade game that was released by Namco in 1986 and licensed to Atari Games for US manufacture and distribution. It runs upon Namco System 86 hardware, and was later converted for the Sinclair ZX Spectrum, the Commodore 64, the Amstrad CPC, the Atari ST, the Commodore 64, and the Nintendo Family Computer. It was also featured in Namco Museum Encore. The player takes control of "Albatross", a member of the WCPO's (World Crime Police Organization) "Rolling Thunder" espionage unit. Albatross's mission is to save a missing female agent named Leila Blitz from a secret society named Geldra located in New York City. Albatross must travel through two different segments or "stories", both comprised of five stages, for a total of ten game stages. On each stage, Albatross can enter doors, to hide and take cover from enemies, as well jump over to higher or lower floors with rails, including stairs. Albatross begins this game armed with a standard-issue pistol, which can be substituted with a fully automatic assault rifle that allows for continuous firing by holding down the firing button. Albatross can gain ammunition for either weapon, by entering doors which are marked "bullets" or "arms". Despite the presence of a life meter, Albatross can only take two physical hits from the enemy: a single hit drains half of the meter, and he will be killed instantly when struck by a projectile attack such as enemy bullets or lasers. (However, all bullets can be blocked by your own). This is the first game in the Rolling Thunder trilogy. It was followed by two sequels: Rolling Thunder 2 (1990) and Rolling Thunder 3 (Sega Genesis, 1993). The Sega game of Shinobi (1987) and the SunA Electronics game of Rough Ranger (1988), along with the Taito Corporation game Crime City (1989), also feature similar gameplay to this series, except that they were all released before the second one. First stage of the game. This page was last edited on 26 October 2012, at 15:25.